Get more Feel Good Friday at The Girl Next Door Grows Up. 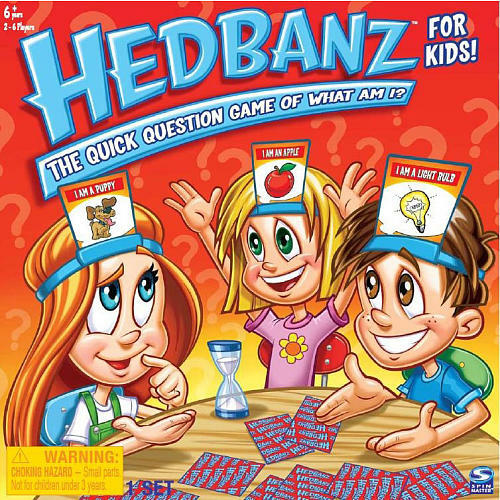 Are you familiar with the children's game "Hedbanz?" Each player wears a headband with a card stuck in it, that all other players can see. Then players take turns asking questions in order to figure out what they are. Could I be a pet? But when you are eight years old, you don't need suggestions. I sat in the living room last night, listening to Aliza and the little neighbor girl playing Hedbanz, and they went back and forth asking questions. They started out right away with specifics. And then it started to go in an odd direction. Do I have wood on me? Can I be rubbed against the wall? And I couldn't take anymore. I fell on the floor laughing. And immediately got up to start writing it down. People, I could not make this stuff up. I wish I could. Kids are hysterical if you listen to their conversations. Bwa ha ha ha! I remember playing that game!!! LMAO, Way too cute!!! Kids say the darnest things, Art Linkletter was right. You have also given me an idea for next week. Bwahahahaha! Yes to all of the above. My husband and I go to a comedy club every few weeks and they actual use this game in one of there sketches and it's hilarious! I can only imagine the scene that you described!